This is part of a series of free Wall Street Examiner Pro Trader reports that I’m posting as I recover from my emergency open heart surgery on May 3. This report covers Treasury Supply and Demand trends and what they tell us about the outlook for the US stock and bond markets. If you are a subscriber, these free reports will not be charged to your subscriptions. When full publication resumes I will credit your account for all of the downtime since the date of the last report you received. This applies to all Pro Trader services. I expect to resume regular subscription publication later this week. I thank each one of you for your patience and support! Thanks to the many of you who have written to me directly offering your encouragement! I truly appreciate hearing from you. If you are a new reader, enjoy! Click here for subscription information. 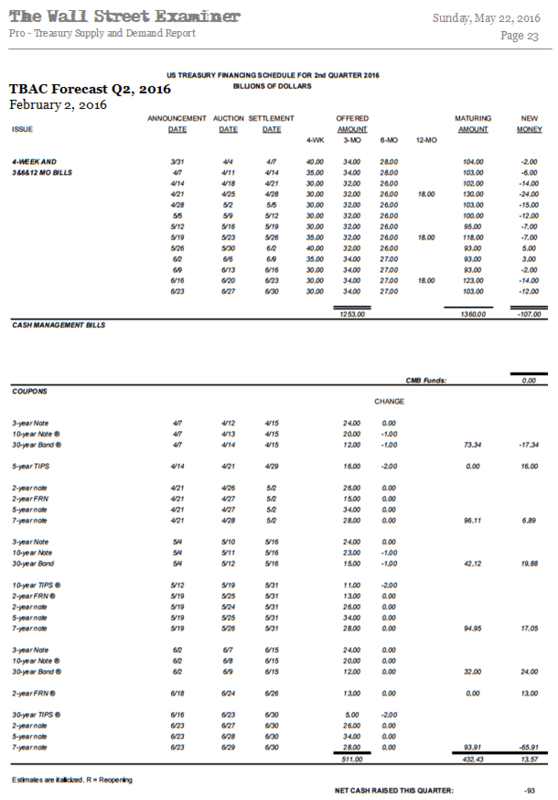 This report may also be downloaded as a pdf, the normal format for subscriber delivery. Format notes – Current material is in this style. Material that was updated recently is in this color. Dark blue sections consist of older background material. Treasury supply will now be a negative factor for the markets through early June. This is unlike the late April, early May period where the Treasury was paying down debt thanks to the cash flows from April tax collections. Those debt paydowns put cash back into the accounts of the erstwhile holders of the paper that was paid off. Those holders include dealers, banks, foreign central banks (FCBs) and other investors. Those investors, particularly the dealers redeploy some of that cash into other short term paper, bonds, or even stocks as a short term parking place. Hence the seasonal lift we often see in stock prices in April and early May. The paydowns have come to an end and the Treasury is once again raising cash through debt offerings. That increase in supply will be a negative for the markets most of the time between now and year end. The only exceptions will be the quarterly estimated tax collection windows in mid June and mid September, when the Treasury also pays down debt. These paydowns are smaller and don’t last as long as the April-May period, and therefore they have less of an effect. For the most part, Treasury supply will put pressure on the markets. This will be magnified if Primary Dealers, FCBs, and banks don’t take a significant share of the new supply. 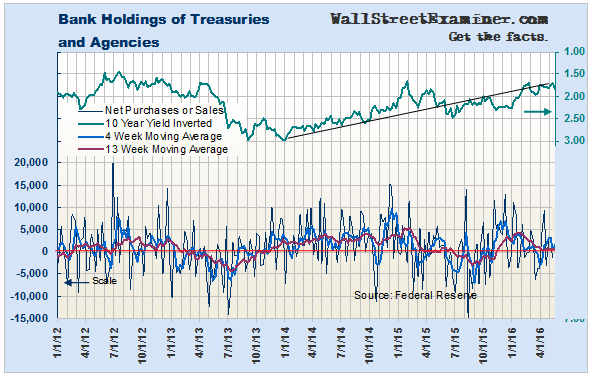 So far, the evidence is that the trends are going the other way, with demand for Treasuries gradually falling. This does not bode well for the long term trend of stock and bond prices. However, the constant pumping of cash into the world liquidity pool by the ECB and BoJ is an offsetting factor that tends to inflate asset prices, particularly in the US. We cover this process in the Pro Trader MacroLiquidity reports. The combination of money printing and negative interest rates in Europe and Japan drives capital out of those markets and into the US in a process I call NIRPitrage. This provides ongoing support for US asset prices. The result is a standoff. There’s not enough juice to keep the US financial asset bubble expanding, with dealers banks, and FCBs reluctant buyers at best. But it is enough to prevent prices from collapsing. This standoff contributes to rangebound markets. Another factor boosting the markets every month around mid month is the Fed’s settlement of its forward MBS purchases. That period this month runs May 12-23. The total to be purchased is $32.5 billion. This cash goes directly into Primary Dealer accounts. Not coincidentally it is exactly the month of net new supply issued by the Treasury over the past 4 weeks. With no catalyst for change, I see little reason to expect the outlook to change over the near term. 4/19/16 The massive flow of tax collections this week causes the Treasury to pay down debt from now to mid May, putting cash back into the accounts of dealers and investors. At the same time, the Fed is adding cash via its regular monthly MBS purchase settlements April 13-20. Those combined cash injections have contributed mightily to the market’s upward tilt. This comes as no surprise. 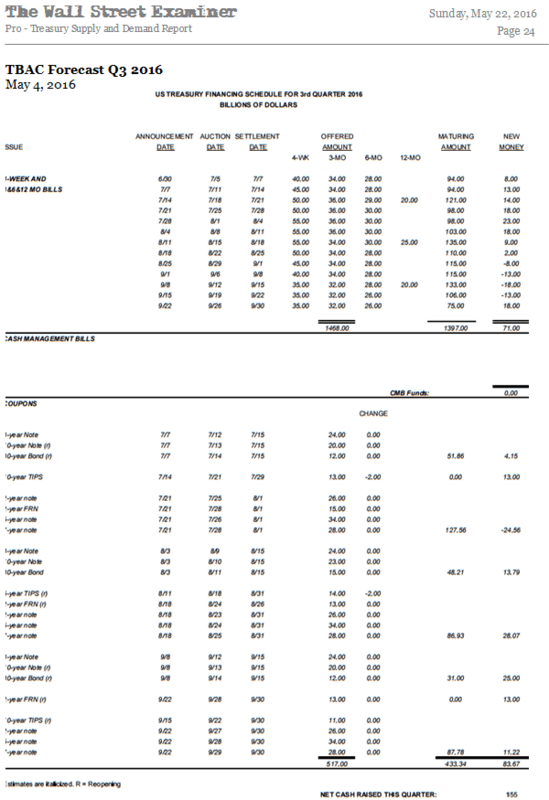 It is a regular annual seasonal effect of the Treasury paydowns that come every April. This year that’s compounded by the massive inflows of cash being driven out of Europe and Japan by the combination of ECB and BoJ money printing and negative interest rates. I cover that issue in the Macroliquidity reports. The flows will slow in mid May with modest new supply coming at the end of the month and early in June. But then the Treasury paydowns will begin anew in mid June. Estimated taxes flow into the Treasury on June 15, and then back out to investors as Treasury paydowns for a couple of weeks. The June paydowns will again coincide with the Fed’s mid month cash injection. As a result, any real downside in the markets is likely to be delayed until July at the earliest. 3/21/16 US banks and foreign central banks continue to show their non support of the Treasury market as the US government pounds the market with new supply. That has impacted the markets as Treasury prices have fallen, yields have risen, and the rise in stock prices has begun to slow. These same forces will continue to negatively impact the market until the big Treasury paydowns coming in mid April to early May. In fact the TBAC forecasts no new supply at all in the second quarter. It projects huge and ongoing paydowns of outstanding short term bills. That’s now a questionable proposition as revenues continue to falter (see Pro Trader Federal Revenues reports), but the Treasury could opt to use some of the massive cash pile it has built up over the past year to pay down some of those bills. Obviously I can’t predict whether it will opt to do that, but if it does, the bill paydowns would be bullish as it would put cash back into the accounts of the holders of the paper. Without being able to roll that paper over, those holders would need to redeploy that cash. That could act to push down short term rates if they opt to continue to hold short dated paper, or it could lower longer term rates if they go out on the curve looking for yield. Finally, some could opt to park cash in big cap stocks. 2/22/16 The second quarter will have the usual windfall of tax receipts. That sends cash paydowns of maturing paper back to the holders of the paper. The TBAC forecasts big paydowns in April in particular, light new supply in May, and another substantial paydown in June. These conditions would bode well for a rally in stocks or bonds. See Addenda for details on individual auctions on a weekly basis. The Treasury issued $32 billion in net new supply over the past 4 weeks. That contrasts with $23 billion in net new supply the previous month. The new supply would normally be a bearish factor, especially compared with paydowns, which add cash to dealer and investor accounts. However, the $32 billion net is a modest amount over 4 weeks and the Fed provided all of the funding needed to absorb the new paper. The Fed’s regular mid month settlement of its forward MBS purchases from Primary Dealers to replace Fed holdings of MBS and GSE paper which were paid down or matured. 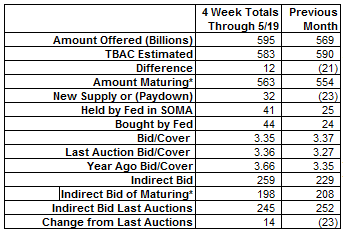 This month, these settlements take place May 12-23 and total $32.5 billion While this simply returns the Fed’s balance sheet to its previous level, on the dealer side it’s a net cash injection to their accounts, as they sell the paper to the Fed. This cash was equivalent to the amount of net new Treasury supply for the past month. These funds now are available to the dealers to use to absorb new Treasury supply, or to deploy in whatever manner they see fit. The availability of this surge of cash tends to put a bid under financial asset prices for a few days during the time and just after the funds are injected. The total amount of Treasury paper offered in the current month overshot the early May estimate of the Treasury Borrowing Advisory Committee (TBAC). The TBAC is a quasi-official committee of Primary Dealers which advises the Treasury on debt offerings at the Treasury’s request. 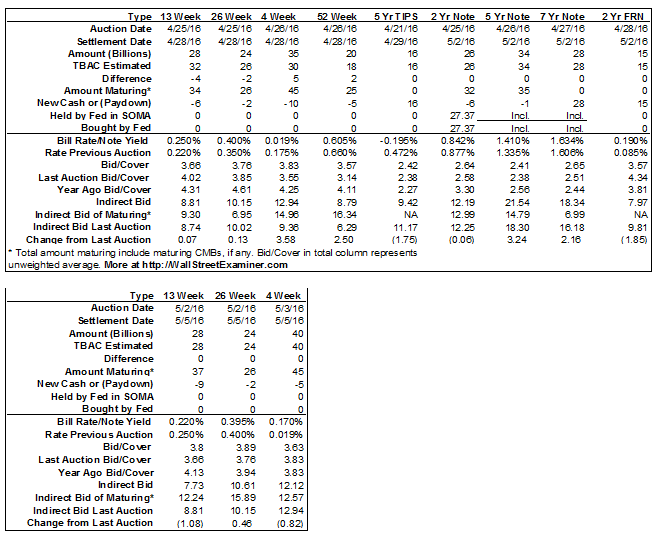 Every quarter the TBAC issues an estimate of the auction schedule for the current and following quarters to guide the Treasury (see Addenda). 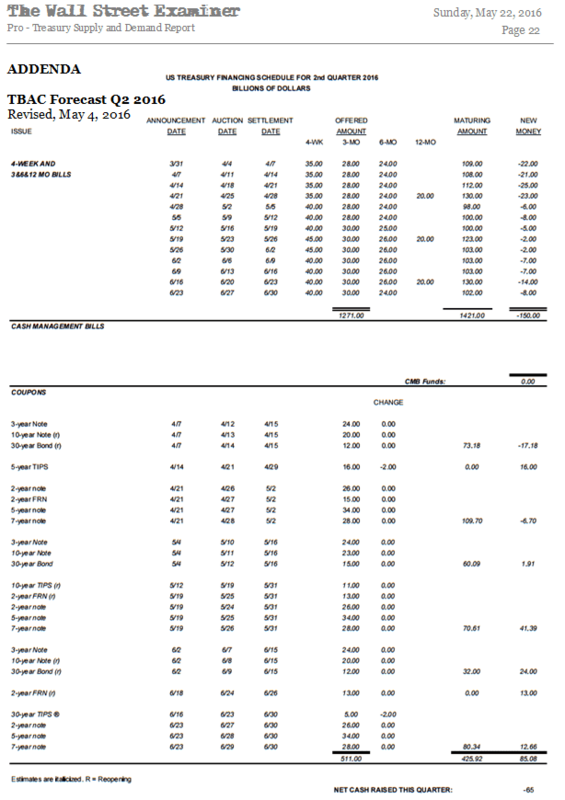 Supply in May overshot the TBAC estimate by $12 billion (see table above). The US economy generated less tax revenue than forecast as withholding taxes fell sharply. In the prior month, the economy generated more revenue than expected and Treasury offerings were below the TBAC forecast by $21 billion. That resulted in a net Treasury debt paydown of $23 billion for the month. Paydowns put cash back into the accounts of dealers and other investors who had held the expiring paper that was paid down. The US Treasury typically pays down debt around quarterly estimated tax collection dates, and April 15 in particular, when annual taxes flow into the government’s coffers. The Treasury uses these cash receipts to temporarily pay down debt. The cash goes back to dealers and others who often redeploy it in other short term paper, bonds, or even stocks. This usually gives the markets a boost during these periods. The TBAC revises its recommendations every quarter in early February, May, August, and November. These reports show the flow of how the dealers and the government view the economy in the short run future, and how the economy actually performs versus their expectations. I track and report the tax data, which is available in real time on a daily basis, in the Pro Trader Federal Revenues report, to get an idea of the impact on Treasury supply going forward. In the February forecast for the April-June quarter, the TBAC foresaw the government issuing $1.25 trillion in new short term bills versus maturities of $1.36 trillion, for net paydowns of $107 billion. It forecast $511 billion in total coupon issuance against maturities of $432 billion for net new supply of $79 billion. After seeing the performance of the first 6 weeks of the quarter, the TBAC issued its revised forecast in early May. Including the actual amounts for the first 6 weeks, the TBAC estimated new bill supply of $1.27 trillion, with maturities of $1.42 trillion resulting in net paydowns of $150 billion. However, all of that difference has already occurred. For the May-June period the TBAC now expects paydowns to be reduced from $53 billion to $46 billion. The difference was in bill issuance. The forecast for coupon issuance was little changed. In its quarterly report to the Secretary of the Treasury in early May, the TBAC noted that the economy was weaker than expected in the first quarter, but that financial market performance was boosted by the constant injections of cash into the markets by the BoJ and ECB. Apparently they view this as a good thing. The report reviewed the performance of different segments of the economy versus expectations, noting that business investment was particularly weak while seeing strength in residential. Where they noted positive developments, these were in the context of the past 7 years, rather than on a long term, historical basis. So for example in relation to residential investment, they noted the best growth since the recovery began, but failed to point out these the total activity remains at depression levels historically. Relative to the long term, many of the positive numbers remain historically depressed. Against this economic backdrop, the Committee reviewed Treasury’s May 2016 Quarterly Refunding Presentation to the TBAC. During the first quarter of 2016, tax revenues were weaker than during the equivalent period last year, while Treasury net expenditures rose due to higher interest expense and increased Medicare outlays. Treasury projects a net borrowing need of $687 billion for FY 2016. Between FY 2016 and 2018, Treasury’s borrowing from the public would increase significantly if the Federal Reserve were to allow the SOMA Treasury securities to mature. [This is why, as I have pointed out in the past I expect that this will never happen.] The Bid-to-cover ratios for FRNs and shorter-dated coupons have fallen moderately in recent months [weaker demand] , while bills and longer maturity nominal have remained stable. Treasury’s cash balance fell moderately to $314 billion at the end of the first quarter. The Committee’s first charge was to discuss potential adjustments to the auction calendar. The Committee continued to recommend an increase in Treasury bill issuance to support the demand for high quality liquid collateral in light of money market reform and other regulatory changes, as well as to build operational cash balances. The last comment refers to the $500 billion “rainy day fund” which the TBAC recommended a year ago. We have been tracking the buildup of that fund in the Pro Trader Federal Revenues report. As those funds are withdrawn from the banking system and put into a more or less permanent deposit account at the Fed, their effect is the same as a Fed drain. The withdrawal of these funds from the economy and the markets to build up this fund has a negative impact on both the markets and the economy. At the current pace the effect is modest at most, especially in view of the ECB and BoJ pumping the equivalent of approximately $160-170 billion per month into the worldwide liquidity pool. The massive money pumping of the ECB and BoJ is the overarching market factor against which all other influences must be considered. 2/14/16 The TBAC’s revised estimate and recommendation for this quarter posted earlier this month recommended an increase in bill supply, including regular issuance of $55 billion per week in 4 week bills through March 10. The TBAC has boosted its 3 month bill recommendation from $30 billion to $37 billion per week, and the 26 week bill from $26 billion to $30 billion per week. Conversely, they have reduced the 52 week bill recommendation from $25 billion to $18 billion. The TBAC says that the reason for this increase in bill offerings is the market’s need for “high quality short term collateral.” But the net effect will be to put upward pressure on short term rates as the offerings remove liquidity from the system and lock it up in the Treasury’s account at the Fed. This is not the same as the government raising cash for immediate spending which pumps money into the economy. Because these increases in supply remove cash from the system for “safekeeping” in a permanent rainy day fund, it has absolutely the same effect as the Fed draining reserves from the system by selling assets. The Treasury can, if it so chooses, spend the money or pay down the outstanding bills later. If the government spends the money on regular outlays, it would boost economic activity. If it uses the cash to pay down the T-bills, then that cash will return to the accounts of the holders of the paper, many of whom are dealers, and that would boost the financial markets. In the meantime, as the Treasury drains this money from the system, this will act as a market depressant, although we don’t know which market will take the brunt of the hit. That’s a question for ongoing technical analysis. There’s some reason to think that Treasuries will now take the hit (see below). Because it will be tied to reduced liquidity, it won’t help stocks. I have put the S&P 500 on the chart below so that you can see the clear correlation between the Treasury adding or draining cash from the system and the direction of stock prices. Last February Treasury cash fell as it does every February when the IRS pays out the bulk of its tax refunds. Apparently some people used the refunds to play the market. Stock prices rose from 2000 to 2100. In April, the Treasury’s balance rose due to tax collections. That had no impact on stock prices. Then, when the Treasury’s balance fell in September and October because the Treasury was forced t0 pay down debt due to the debt ceiling the SPX went from 1900 to 2100. A debt ceiling deal was done at the end of October, and the Treasury immediately started pulling cash from the system by issuing huge amounts of new debt. As the Treasury pulled nearly $300 billion in cash from the system, the SPX went from 2100 to 1850. This has been a direct cause and effect relationship particularly visible over the past year due to the unusual, huge swings in Treasury cash. The Treasury will continue to pull cash from the system in the months ahead but at a much slower pace than in the past 3 months. The depressant effect on stock prices should be more muted, and there are other forces whose relative impact on the market will become more important. T-bill rates rose over the past couple of weeks, not because of anything the Fed said or did. As usual, the rate fluctuated on the changes in new bill supply. The Treasury began increasing the size of the 4 week bill offerings at the beginning of May. The offerings have totaled $45 billion per week this month, versus $35 billion per week in April. With demand stable, rates rose. If the Treasury follows the TBAC recommendation to increase bill supply as it builds its rainy day fund, this will continue to put upward pressure on rates. 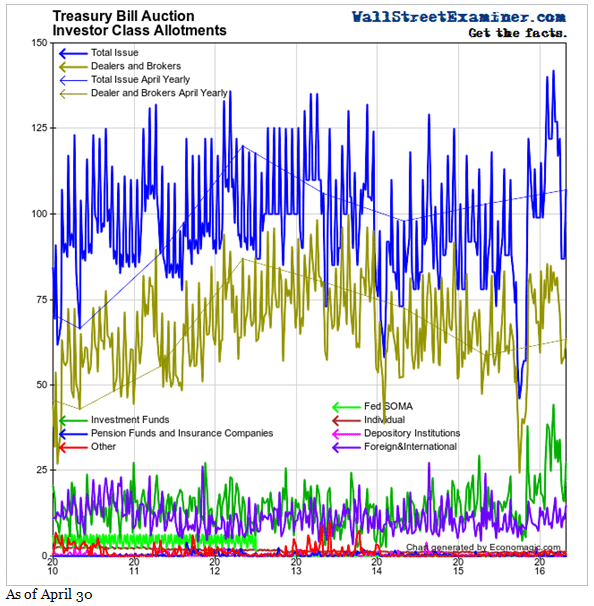 4/19/16 Interest rates in the market for Treasury bills continue to have a life of their own, virtually unaffected by the Fed’s ham-handed effort to rig the money markets. This market tightened on its own well before the Fed moved. Then it stabilized for a while making it look like the Fed’s con was working. The real reason in February and March was that the Treasury increased the weekly supply of 4 week bills from $40 billion to $60 billion. That extra supply put upward pressure on short term rates. But then at the end of March the 4 week bill rate fell out of bed when the Treasury started cutting the supply of 4 week bills, which it has now reduced to $35 billion per week. Suddenly there was too much cash and not enough paper to absorb it. The 4 week bill rate fell below 10 bp at one point before rebounding to 21 bp early in April. Over the past few days, the rate has been falling again and is back in the teens as cash has begun to flow in from income taxes, allowing the Treasury to pay down even more debt. By putting that cash into the accounts of the holders of the expiring paper, it forces them to bid more aggressively for the remaining short term paper on the market, pushing rates down. This is just one measure of the excess liquidity temporarily in the system as a result of these paydowns. More liquidity is also pouring in to the US system as negative rates in Europe and Japan drive funds out of those markets and into the US. Lower interest rates in the US are just one manifestation of too much cash flowing into the US. The other manifestation is rising stock prices. The stock market rally is not a sign of how healthy the US is. It is a sign of how sick the entire worldwide central bank addled financial system is. 1/24/16 So it finally appears as though the Fed has magically manipulated the market into a rate rise. But the reality is that the market is tightening on its own. Falling securities and falling commodities prices destroy liquidity and cause a cash squeeze on carry traders holding rapidly depreciating positions, last week’s rally notwithstanding. 1/18/16 An indication that the Fed does not control short term money rates was that the 4 week bill peaked at 26 bp the day of the announcement, December 16, and then slid all the way to 10 bp before rebounding to 22 bp last week at last week’s auction. That’s still below the Fed target range the Fed Funds rate of 25-50 basis points. By the end of the week the 4 week bill was trading back at 19 bp. Supply will be heavy in the last week of May, with $42 billion in net new supply on the schedule, assuming that the amount of the 4 week bill to be announced Monday will be the same as last week and as the TBAC has forecast. $42 billion should be enough to put downward pressure on either stock or bond prices (maybe both) particularly since the market gets no help from the Fed at the end of the month. We can’t predict whether stocks or bond will feel the greatest pressure. That’s a job for technical analysis. One market normally falls at the expense of the other. Offerings will total $236 billion. That is $5 billion more than the TBAC forecast, suggesting that the economy is generating less tax revenue than the Primary Dealers than the government expected just a few weeks ago when they issued the forecast. 4/5/16 Federal withholding tax revenues rebounded in recent weeks (See Federal Revenues report) allowing the Treasury to reduce bill offerings as the TBAC had forecast. This was a change from our expectation that they would not be able to do that, due to falling revenues. The reduction in bill supply will be a bullish factor for as long as it lasts because the paydowns put cash back into the accounts of the holders of the expiring paper, which includes dealers, banks, and other investors. The dealers are the ones who matter most because they’re more likely to divert cash into longer term bonds or even stocks. This is why paydowns are virtually always bullish. For the second quarter as a whole, the revised TBAC estimate issued in early May now calls for net paydowns of $63 billion. In the February estimate for this quarter, they expected paydowns of $93 billion. Tax revenues did not meet expectations, as the economy was weaker than forecast. More importantly, when the May forecast was issued the May-June period was yet to come. For this period the TBAC adjusted its forecast to $40 billion in net new supply versus the February expectation of just $27 billion in net new supply for this period. While this amount probably won’t materially affect the markets, it underscores the tendency of forecasters, both in and out of government to overestimate the likely strength of the US economy, more often than not. The trend should continue to be for growing and higher than expected levels of new supply. Over time, that will act to depress prices. The question is whether that will be sufficient to overcome the price lifting effects of BoJ and ECB money printing. That’s a question for Technical Analysis to address. Bill supply has been surging as the Treasury follows the TBAC recommendation to increase bill offerings. However, the takedown by dealers has not kept pace with the increase in supply. Investment funds have taken up the slack. After foreign buying of Treasury bills rose in March, as the supply of bills increased foreign accounts cut back in March. This appears to be within typical range of fluctuations as the 52 week moving average remains stable. Coupon issuance had been declining since 2009. It leveled out in the past year, but the dealer takedown continued to decline. The spike in February reflected the first rollover of Fed QE purchases. You can see the spike in SOMA holdings at the bottom of the chart. Consequently, there was no increase in public supply. The Fed just bought replacement paper for the huge wad of Treasuries it already owned that was maturing. This chart illustrates exactly why the Fed can NOT shrink its balance sheet in any meaningful way. The Treasury would have had to refund that paper in the market had the Fed not rolled it over. That would have pounded the market. Meanwhile, dealers continue to cut their buying as investment funds continue a 5 year buying spree. Foreign buying of Treasury coupon issues bottomed in 2013 after several years of sharp reductions. It came back a little but has essentially been moribund since 2013. 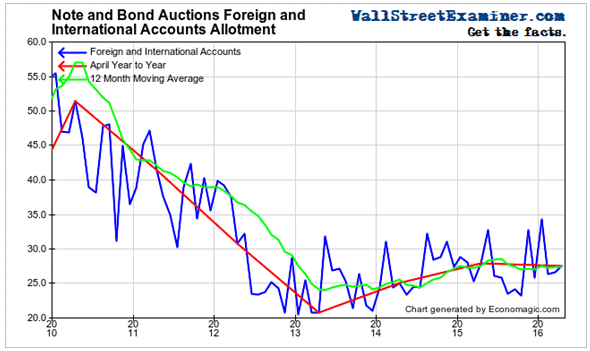 However, foreign demand has not weakened materially since then as some pundits are claiming. After declining steadily since 2009, the trend of Treasury supply has leveled out over the past year. Supply will begin to increase if the US economy weakens. That would cause revenues to fall. The brief period of negative economic growth and shrinkage in revenues in the first quarter appears to have been a false alarm, but we will continue to follow this closely in the Federal Revenues report. Combined with the long term trend of weakening demand, any increase in supply would be a recipe for a perfect storm of falling prices and rising yields. Even stable supply with falling demand is a recipe for trouble. We’re not there yet, but are headed in that direction if current trends persist. 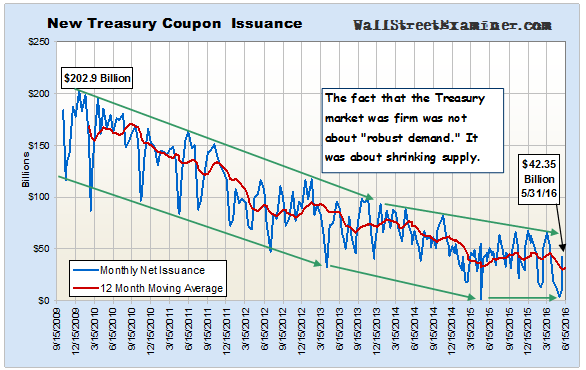 9/5/15 Shrinking Treasury supply has supported the Treasury market since 2009 and excess liquidity with nowhere else to go flowed to stocks. If the trend of shrinking Treasury supply reverses, then an environment which has turned hostile in other ways would turn more hostile for both bonds and stocks. The proposition that the Treasury market is supported by deep and robust demand isn’t supported by the data that we watch. Demand comes and goes. The fundamental constant for the past 6 years has been shrinking supply. As the US economy begins to weaken as a result of worldwide financial market turmoil the Federal Budget deficit will grow, the US Government will borrow more, and that increase in Treasury supply will hit the market, adding to the pressure. 12/5/15 I have compiled the data on coupon auction demand and can now show that the demand has also been declining along with supply. 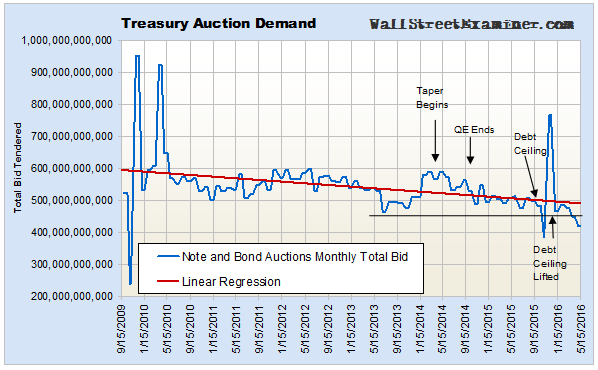 The chart below shows the total monthly bid tendered for Treasury note and bond auctions of longer than one year term. The linear regression line shows a decline in demand of approximately 12% since 2009. New supply has dropped by two thirds. Obviously, supply has dropped far faster than demand. We’ll be on the lookout for any sign that the gap between those curves is beginning to close. That would be bad news for both Treasuries and stocks. 1/2/16 With the bulge in supply and demand resulting from the lifting of the debt ceiling now well in the rear view mirror, total demand for the December auctions is back below the declining regression trendline. Total demand at the April auctions dropped, continuing the downtrend of the past 7 years. 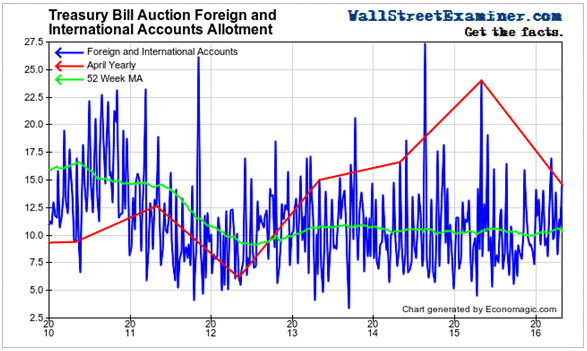 The total bid tendered at the coupon auctions reached its lowest non debt ceiling impacted level in that period. Yields have remained low in spite of that because of falling supply, a trend which has probably ended. Under the circumstances, weakening demand will at some point cause yields to begin rising. However, we’ll only know when that is when the price action tells us. We’ll keep an eye on the charts for that. Primary Dealers boosted Treasury coupon and Agency positions while cutting MBS and Corporates in the week ended May 11. 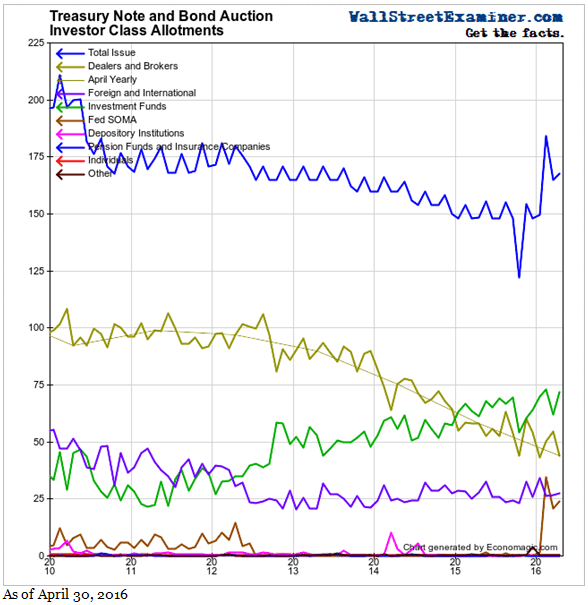 3/29/16 Their long positions in Treasuries have pulled back sharply from near the all time record levels reached at the 2012 top in the bond market (bottom in yields), but they remain relatively high. The mainstream media has recently made note of these large positions while failing to understand report their meaning accurately. 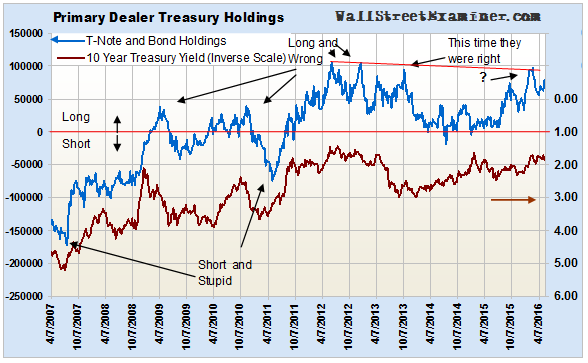 The dealers’ positions peaked as yields hit their lows. They were not forced to take on these positions as the pundits assert. They were bidding aggressively, willfully building these positions. The dealers hedge their cash positions in the futures markets. They have been well hedged, with a near neutral position overall in Treasuries considering both cash and futures. Dealer positions in Treasury coupon futures the week ended May 17 were net short approximately 482,000 contracts versus 497,000 a month before. The face value was $56.3 billion short versus $57.9 billion short a month earlier. The value of their long cash positions in T notes and bonds was $77.9 billion in the week ended May 11, up from $70.1 billion on April 13. On balance they got slightly longer the Treasury market but this was offset by a drop in their long MBS positions. The futures data is for the past week and the cash positions are from 2 weeks ago. This lag in the data gives us a sense of where they were, but does not tell us of any shifts since then. 2/5/13 The “smart money” Primary Dealers have been most wrong at major turning points and their mistakes can have cataclysmic repercussions. The CFTC disaggregates financial traders. The category of Dealer Intermediary would largely represent the Primary Dealers. They increased their net short position in the 10 year futures to -220,718 in the week ended May 17 from -122,568 as of April 19. This is a record dealer short position. Leveraged funds are also short. The Fed’s custodial holdings of Treasuries and Agencies for FCBs fell by $16.5 billion over the past month. FCB buying stalled and has turned into sales and redemptions after a weak upswing in the first quarter. The intermediate trend has been heading down in recent weeks after being neutral from October of last year to April this year. The longer term trend continues to be down. We do not know whether this represents an outright reduction in holdings, or some holders shifting holdings from the Fed to other repositories. We do know that from time to time correlations exist between the direction of these holdings and both the stock and bond markets. There’s some basis for recognizing a degree of cause and effect in this relationship. The Treasury was paying down debt over that 4 week period, pumping $41 billion in cash into dealer and investor accounts. The simultaneous decline in FCB holdings was probably a result of that rather than evidence of them selling into the market, as some of their holdings were redeemed. The Treasury market is slightly stronger than it was 4 weeks ago as a result of the Treasury paydowns. But stocks are slightly weaker. Without FCB buying pumping cash into the US system there simply is not enough juice to push the markets materially higher. It’s remarkable that stock prices have held up as well as they have under these conditions. By deduction and observation of other data we know that ECB and BoJ money printing combined with negative interest rates drives capital out of Europe and Japan into the US where it still finds higher yields. I call this NIRPitrage. NIRPitrage flight capital continues to boost US markets, in what otherwise would be a hostile environment. 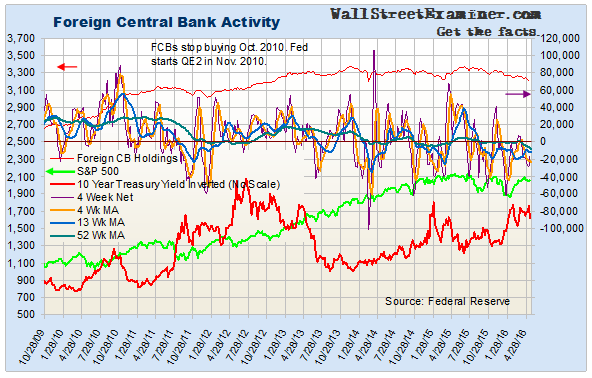 Instead of buying Treasuries outright, the two big FCBs are printing money which banks then use to purchase US assets. 1/9/16 If the recent brief uptick in their buying was the up phase of their buying cycle, what happens in the down phase? If the FCBs start liquidating on a regular basis because they need to repatriate cash, this could have devastating impacts on US markets. US Commercial bank holdings of Treasuries and Agencies rose by a minuscule $1.9 billion over the 4 weeks ended May 11. That compares with an increase of $5.4 billion a month earlier. The weak buying by banks did not hurt the markets during that time window because the US Treasury was in the midst of its usual April-May debt paydowns. As tax collections come in and are processed in the last two weeks of April, the Treasury uses that cash to temporarily pay down debt. That 4 week period from mid April to mid May saw paydowns totaling $104.5 billion. This cash went back into the accounts of the erstwhile holders of the paper that was paid off. That includes dealers and other investors who may redeploy the cash into other short term paper, bonds, or stocks. 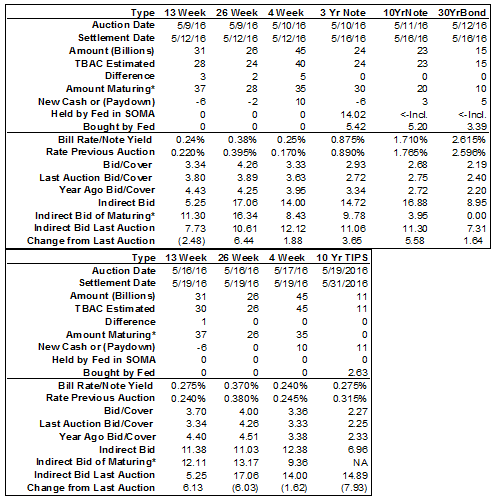 This annual process tends to give stock and bond prices a lift in late April and early May. The process then reverses as the Treasury comes back to the market to raise new money in May. The inflow of estimated taxes in mid June provides another brief period where paydowns can boost the market, but the effect is far smaller than in April. The summer is the weakest period, and the Treasury tends to raise the most cash via debt offering during those months. If banks don’t step up to take a significant share of that, it usually spells trouble for stocks and bonds. The trend of bank buying has been flat this year. Unless there’s an uptick in that pattern, the lack of bank buying as the Treasury begins its seasonal increase in supply would be a negative factor for prices. 2/19/16 However, here again, the negative interest rate (NIRP) factor in Europe and Japan is a wild card that continues to foment intermittent rallies in stocks, and more or less constant buying of Treasuries. In theory that is only sustainable for as long as foreign deposit holders do not decide on balance to use deposits to liquidate debt, a rational decision which more and more holders will reach the longer NIRP is in force. At some point as US yields sink and perceived risks increase, rather than transferring capital out of Europe and Japan into the US, they’ll just liquidate and the worldwide liquidity flows into The Last Ponzi Game Standing (US markets) will shrink. The Fed probably recognizes the benefit that NIRP arbitrage holds for the US and therefore would never go to negative interest rates. As long as US rates are slightly positive, the more this arbitrage works to the benefit of US markets. In the UK, Mark Carney said last week that the UK will never go to NIRP, because he said that the evidence shows it’s counterproductive. In reality, he knows that as long as the UK has positive rates, NIRP in the Eurozone will work to the UK’s benefit. 2/8/16 Applying a little technical analysis we see a negative divergence in the 4 week average, and the 13 week average near the peak levels of 2012 and 2014 where bond prices peaked and yields bottomed. This could be a similar setup to those major turning points. 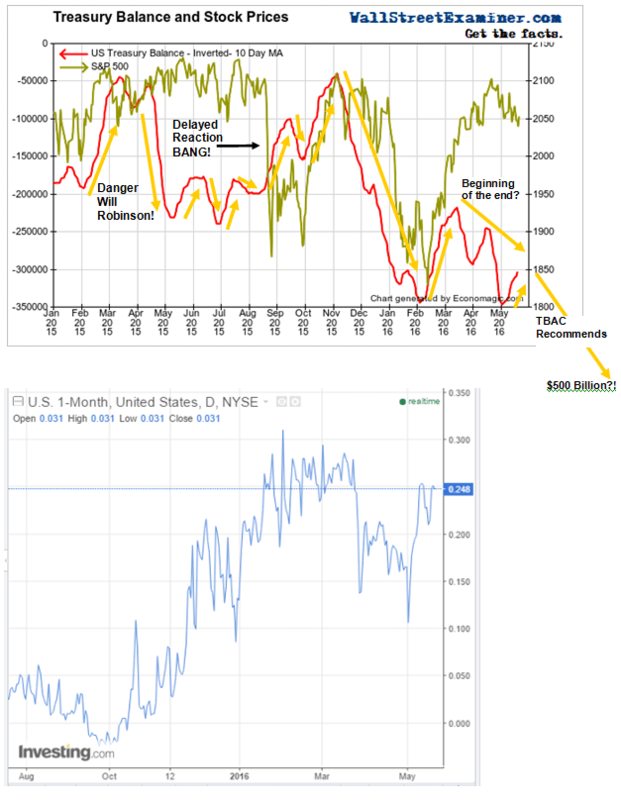 7/27/15 Treasury market performance has tended to correlate well with this indicator since 2010 (chart below).Trends in the monthly rate of change in bank holdings of Treasuries have tended to reverse either just ahead of, or concurrent with, trend changes in the bond market. The monthly rate of change is now near the level where it bottomed in 2011 and 2013, but it is not yet near a break of the downtrend in effect since December. The stock market in recent years has rallied regardless of what this measure was doing. However, that could change if banks began to refrain from injecting liquidity into the markets by stopping their fixed income purchases altogether. They may do so if the bond market begins to move against them consistently. Even though the Fed might want to play the game of pretending to raise short term rates, The Fed and its cohort central banks would want to keep bond yields from rising materially, at all costs. If yields were to break out, I think it would mark the beginning of the endgame.